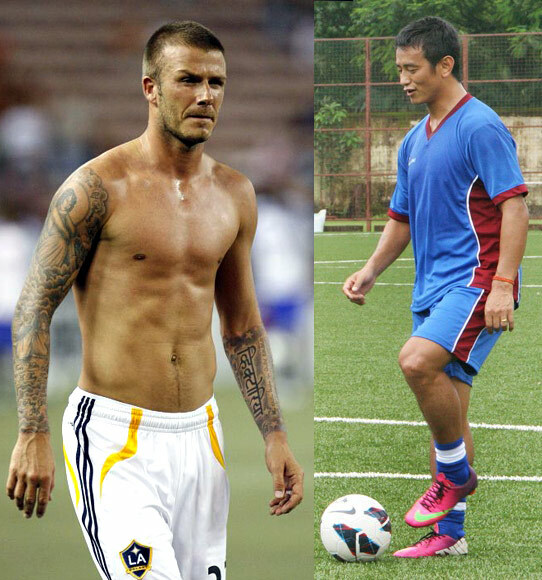 Rediff.com » Sports » Bhutia yearns to bend it with Beckham! Bhutia yearns to bend it with Beckham! Former India football captain Baichung Bhutia tells Laxmi Negi the IPL-style football IMG-Reliance league will not only bring in some of the world’s leading players, but spectators to the grounds too, something the struggling I-League cannot do. Baichung Bhutia, the face of Indian football, is with the new league! The former India captain minces no words while voicing his outright support for the upcoming IPL-style IMG-Reliance football league. The co-owner of United Sikkim Football Club has urged I-League clubs to put egos aside and work for the betterment of Indian football. The ‘Sikkimese sniper’ says the need of the hour is for both, I-League clubs and IMG-R, to look at the larger picture in the interest of Indian football. The 36-year-old striker was the first Indian to play professional football in Europe, turning out for the English club Bury FC in 1999. He had the opportunity to rub shoulders with greats like Didier Drogba, Steven Gerrard, Samuel Eto'o, Gennaro Gattuso, Michael Ballack during a campaign to raise funds for charity ahead of the 2010 World Cup, before his farewell match against a star-studded FC Bayern Munich, in Delhi, in 2011. But having been there and achieved almost everything the game has to offer, Bhutia is still unfinished; he wants to rub shoulders with former England star David Beckham. If he has his way with the IMG-R league, he could well have one last hurrah, not only with the former Manchester United, Real Madrid and LA Galaxy player but other leading contemporary players who are likely to grace the event, scheduled to kick-off in January 2014. Your views on the upcoming IMG-Reliance league. How will it affect Indian players? The new tournament, which is designed on the lines of cricket’s Indian Premier League, will last just two-and-a-half months; it is great for Indian football and the players are looking forward to it. In the last 10 years the I-League failed to make a big impact. Therefore, it is important that we have new innovations, new teams, new people investing in this new tournament. With good footballers coming from all over the world, it will bring lot of spectators to the grounds, something the struggling I-League cannot do at this moment. This new tournament will generate the right hype and interest, and also inspire youngsters to make football a career. Also, if the I-League clubs are a little flexible, it will benefit them and the AIFF. But, for that, we need to be together and make sure that the tournament goes well. If the I-League is struggling, should it continue? The I-League should definitely continue, but we also need to bring in new investors. Today, the I-League is stuck between two states, as it is played mostly between Bengal and Goa clubs. It failed to reach to other parts of India. In the last five years, champion clubs like Mahindra United and JCT had to shut shop. It is a sad situation. New clubs, like United Sikkim, are struggling to survive because we do not have sponsors. I go to every corporate house but fail to get sponsors! With this the new tournament we are hopeful that the interest will rise, and, in turn, some people will be interested in investing in the I-League too. Also, three-four years down the line, I hope this new tournament can be clubbed with the I-League and made one tournament. Where did the I-League fail? The I-League failed to reach different states in India. It has hope, but there should be something new and exciting to revive the game. The Federation also didn’t have new ideas to spread the league across the country. State associations, apart from Goa and West Bengal, did not do much to bring in professional clubs. It is a nightmare to start a new club in the I-League! What is the USP of the IMG-R? As of now, things are not clear. But it is true that we are trying to bring in big names, big players, like Michael Owen. These days a lot of Indian players are trying to go abroad and play because they want to play with quality players. When Didier Drogba signed in China it made news worldwide; MLS was not written about until David Beckham went in. Football will be noticed not only in India but Asia if top names come in. It will be a huge opportunity for our players to play with Owen if he does come in. With two tournaments going on, won’t it affect the Indian players’ showing? I don’t think so. Around the world, the Champions League and Premier Leagues go on simultaneously. Players here [with IMG] are equally good. Most of them can easily walk into the national team, such is their quality. We want a lot of players to be playing in the I-League and some coming to the IMG league. The club owners should not just think about themselves but also need to look at the larger picture of Indian football. And at the moment, we need IMG, which can not only add spice, but bring in sponsors and crowds to the stadium. Rather than having big egos, we need to work on it; because of egos, smaller and medium range clubs suffer. Big clubs will have money and will still go ahead and play I-League, but smaller clubs, like Prayag United, do not have that kind of money and will suffer. Churchill Brothers, the winner of I-League, don’t have a title sponsor. There are problems and they need to look beyond this. Clubs need to work together for the betterment of Indian football. Are you an outcast among I-League club owners? Not all I-League clubs are against the IMG. I have been to the meetings and just one or two clubs call the shots. It is unfair to other clubs. We do not have the owners coming to these meetings. We don’t have the Dempos and the Alemaos coming. It’s represented by people who do not have much knowledge about the IMG. Prayag United will be keen and happy to take players from the IMG, but now, since there is this association formed, in which a few people dictate, they also cannot sign players from IMG. New teams, like Ar-hima (Rangdajied United) will find it tough to stay in the I-League. If the I-League continues this way it’s going to be harmful, as we have seen the fate of Mahindra and JCT. You have played with many of the world’s leading players. At the IMG league, anyone special you would like to play alongside or against? The IMG-R has come under immense criticism even before it has started. What made you back this venture? Over the last 10 years we have not progressed much. In the 16 years of my international career the only thing I can boast of is that we qualified for the Asia Cup. So, it is important that we need to look at the national side too. The players play a vital role and get exposed in the leagues like IMG. The become more confident and play competitive matches with good quality players. The confidence and quality of a player improves. Once the players improve, the clubs and the national team will also benefit. All the players want to play this league but they are bound by their clubs. Given a change, everyone will want play in this new tournament. World Athletics Championships: Not a pretty picture! A year after Olympics bronze... Hail Mary!